Vietnam has received a lot of media attention this month, especially in regards to the South China Sea, the Trans-Pacific Partnership, and its increasing relations with major world powers. Reports about the state of rights in Vietnam have also made the news. For example, in Freedom House’s 2015 Freedom Report, Vietnam has been rated as “Not Free.” It received a 6/7 freedom rating, with 7 being the worst possible score, with a 5/7 for civil liberties and a 7/7 for political rights. In addition, early in March, the United States Commission on International Religious Freedom (USCIRF) released its 2014 Report on Vietnam, deeming it a “country of particular concern” in regards to religious freedom. Freedom of religion, along with freedom of expression and association, are only a few of the various rights that are still only partially realized in Vietnam. Other issues include land, labor, and environmental rights, amongst others. Illegal wildlife trafficking thrives in Vietnam, threatening the country’s precious biodiversity. Corruption and inequality are also widespread. Much of the news about Vietnam this past month has related to US-Vietnamese relations. Particularly, while many news outlets have noted the prospect for increasing relations, they also caution that these relations will only continue if human rights are factored into the equation. With Vietnam holding a coveted seat on the UN Human Rights Council (UNHRC), many are calling for change. Over twenty-five organizations and 150+ individuals recently sent an open letter to the UNHRC regarding the rampant human rights violations in Vietnam and calling for the revocation of Vietnam’s seat on the Council. Moreover, the European Ombudsman is pressing for the European Commission to complete an assessment of human rights in Vietnam prior to finalizing any free trade agreement with Vietnam; similar steps should be taken in the US. Hopefully, with social and traditional media as hot topics currently within the Communist Party, discussions about change in Vietnam, coupled with international pressure, can lead to actual change. A recent protest over tree removals in Hanoi demonstrates that citizens indeed do have power in numbers, the and on rare occasion, officials will listen. The success of a factory strike this week also lends support to the idea that citizens’ voices can sometimes be heard. 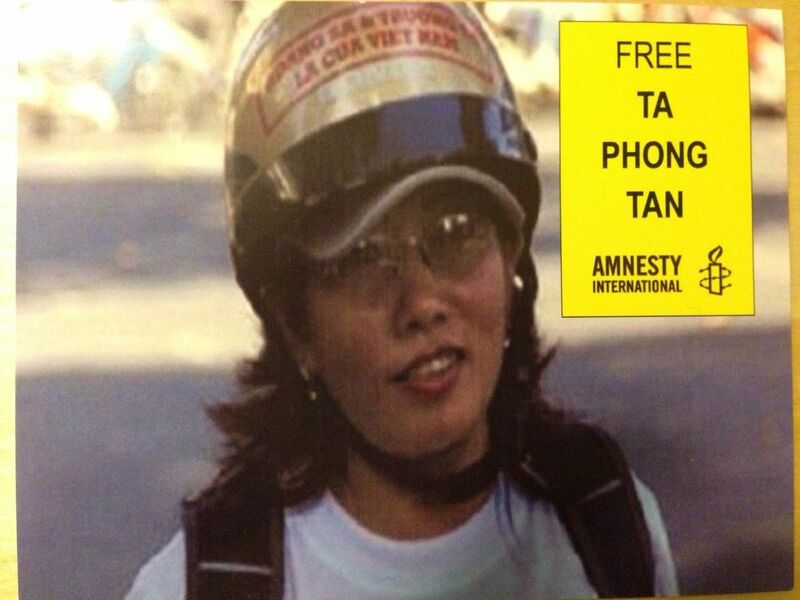 Ta Phong Tan, previously a police officer, was arrested for her blogs and sentenced under Article 88 alongside Phan Thanh Hai and Nguyen Van Hai (Dieu Cay) back in 2012. She is currently serving a 10-year sentence. She has been adopted under the Press Uncuffed campaign, a project of the Committee to Protect Journalists and the University of Maryland’s Philip Merrill College of Journalism. Sources report that Dang Xuan Dieu’s family has been blocked from visiting/communicating with him. Father Nguyen Van Ly, who has spent 20+ years in prison for his peaceful work, is being detained even after finishing out his most recent sentence. Radio Free Asia recently interviewed a former human rights lawyer who was forced out of his profession, highlighting the pressure on those involved in human rights work in Vietnam. 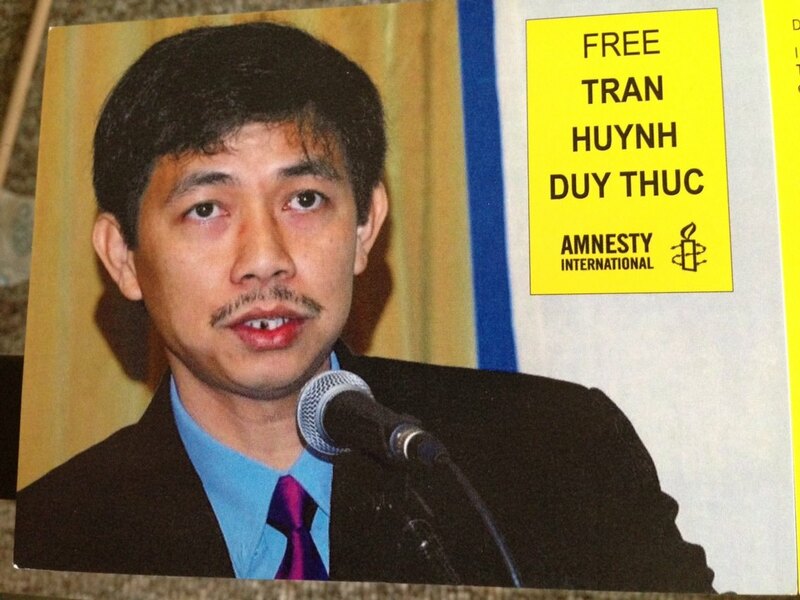 The 88 Project contributor, Huong Nguyen, worked with Amnesty International to spread the word about the cases of Tran Huynh Duy Thuc and Ta Phong Tan at the Amnesty International USA 2015 AGM this month. Stay informed with our Timeline and check out IFEX’s great compilation of news stories regarding Vietnam and freedom of expression. Support the Press Uncuffed campaign: spread the word, and buy a bracelet to show your solidarity with the imprisoned journalists.